Since the Americans with Disabilities Act (ADA) was signed into law in July of 1990, it has undergone several revisions, some of which are designed to clarify specific building codes for schools, including parking regulations, drop-off areas, and the number of accessible entrances required. While these changes have helped clear up some of the confusion regarding the requirements of the ADA, it’s still a challenging proposition to make sure schools, especially older ones, are ADA-compliant. Remember that the goal of this legislation is to provide an environment that is the same for everyone. 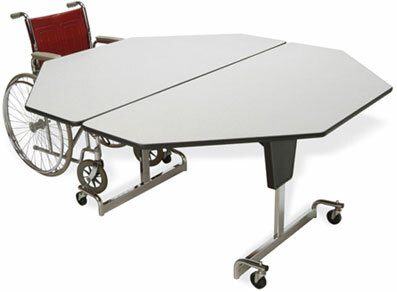 This means creating a space that can be used equally by both handicapped and able-bodied students. Everything in this space, such as classroom furniture, toilets, and doorways must be accessible to all students. Building a new school that’s ADA compliant is not difficult as long as the proper planning takes place ahead of time. It’s important to keep the principle of equal access in mind when designing a new school. Accessibility elements should be designed into the school layout to be as unobtrusive as possible so that those who use them don’t feel singled out. A good planning and design team such as the Hertz Design Center can help with this objective. Retro-fitting an older school to meet ADA requirements can be more challenging. Older schools were typically not built with accessibility in mind. They may have steps up to and inside the building, and include varying levels throughout the school. Toilets, sinks, and classroom furniture are all the same, and science lab tables are too high to accommodate someone in a wheelchair. So how do school administrators go about making the conversion to a school that serves all students’ needs equally? Again, planning plays a key role here. School administrators should evaluate their building from all angles. Everything from interior classroom design to playground access to restrooms should be examined carefully to determine the changes that need to be made, and the best and most cost-effective way to make them. It’s unrealistic to expect that the entire school can be rendered ADA compliant in one fell swoop; rather, it will need to be done in phases. Engaging in a thorough evaluation of the existing situation ahead of time may save both time and money during the conversion process. There are many challenges that need to be considered when working with an older school. This is one reason it makes sense to work with an expert in the area of ADA compliance, such as Hertz Design Center. Issues such as the usage of space, outside accessibility, and specialty areas within the school all need to be figured into the equation. Following is a brief look at these three areas. Space — Space is most likely at a premium in an older school. Narrow hallways and doorways, cramped classrooms, and various level changes throughout the school may make it difficult to install appropriate handicapped accessibility devices such as ramps and elevators. Determining the amount of space available to work with will help determine what’s feasible and what isn’t from a conversion perspective. Entrances — ADA regulations require that schools have entrances that are accessible to all students. This can be a challenge in an older school that was built without accessibility being taken into account. Many older schools have steps leading to the front door. In some instances, there may be space available to build a sloped walkway from the street or parking lot up to the door; in other cases, the school may need to install a new entrance on a different side of the building to accommodate those with special needs. Specialty Areas — Specialty areas within the school, such as science labs, restrooms, and playgrounds also need to be evaluated for accessibility. Each area has its own special needs. For instance, science labs need to include accessible tables and sinks. Restrooms have special challenges with space and plumbing; there’s often no easy way to move existing toilets, sinks, and plumbing to make room for accessible units. And playgrounds not only need to be accessible to all students, but they also need to be safe for those with special needs. Anyone could become handicapped unexpectedly. Many students already face this challenge on a daily basis. It’s important to make them feel included in the school environment. Bringing schools up to ADA compliance is a worthy effort that demonstrates to all students that each of them is valued as an individual.